If you need some help with picking the right birthday messages, you've come to the right place! BirthdayMessages.net has got all the answers to frequently asked questions about birthday wishes, birthday quotes, birthday poems, birthday toasts and more. Every question on this page (and the next one) comes from visitors to this site (visitors like you), so you may find a question that comes very close to the one you would like to ask yourself. 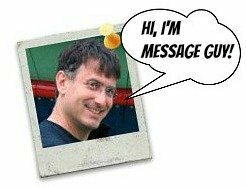 And every answer comes from me: Kevin, Message Guy, the creator of this site. I need the most romantic wishes for my love on her 50th birthday. She is my better half. Do you have one? You need what I call a triple-whammy: a birthday wish that is romantic, 50th birthdayish and wife-worthy. Well, my site certainly has lots of each one. Here are the sections you need to browse to pick the best birthday message: 50th Birthday Wishes, Romantic Birthday Wishes or Wife Birthday Wishes. Remember that you can mix and match any birthday wishes you find, which makes for a much more interesting birthday message. Do you have any 5th birthday messages for my son? With a 5-year-old boy, you don't necessarily have to stick with something "boyish" to reach your son. 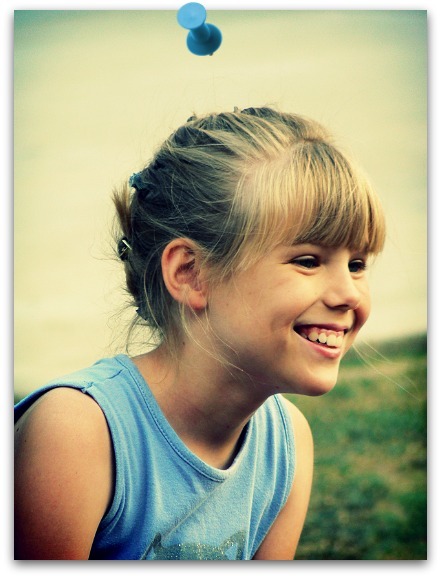 Kids at 5 are an amazing blend of wonder, warmth, joy and love. But figuring out what message to write for them is hard. They most likely care more about their gifts. What’s the best route to take? Probably a mixture of cute and happy...with a touch of the "sentimental" (just a touch) and a sprinkle of humor. If you need some options, check out my 5th Birthday Wishes. Got 29th birthday wishes? It's for my husband's 29th bday. Turning 29 is like appearing right before The Beatles on The Ed Sullivan Show. In other words, it's like being so close to a major milestone (30) yet so far. Still, there is much to say about turning 29 because it is so close to 30. For this reason alone, you can write something meaningful or inspirational, even romantic. This birthday is also fodder for age-related jokes. What’s the best way to go? Because this message is for your husband, you should probably write a message that’s both romantic and funny. What you do more of depends on the birthday boy. Either way, do something that best expresses your feelings. If you need some options, check out my Husband Birthday Wishes section. Or, if you need romantic or inspirational messages, go to my Romantic Birthday Poems or Inspirational Birthday Poems section. Do you have birthday wishes for my lover's 16th birthday? By the way, she has a girly personality. Girlfriend birthday messages should be romantic. Because your girlfriend has a girly personality, romance is a must. The perfect birthday wish will make your girlfriend’s heart flutter and, even better, sweep her off her feet, making you a modern-day Romeo and giving your inner Casanova new life. If you need some options, check out my Girlfriend Birthday Wishes section. 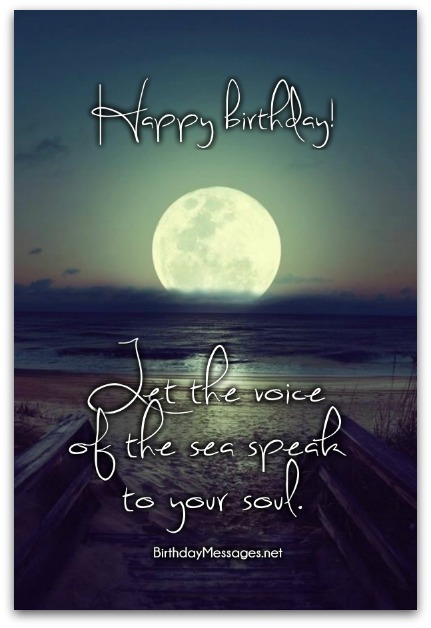 My husband's birthday is soon and I want to send him a card with a wonderful message. We have two daughters and have been married for seven years. And I am blessed to have him as my husband. Do you have a sweet message for my husband? I love a good romance. I especially like to see a great marriage. I have a great one too, so I know the type of birthday message I would like to receive. It should be romantic, sentimental and inspirational...all in one amazing birthday message. 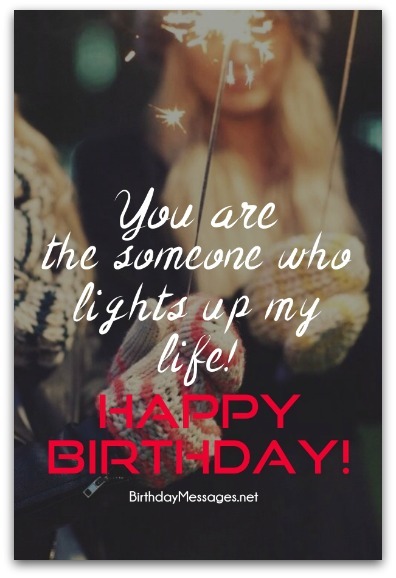 I would go to my Husband Birthday Wishes, Romantic Birthday Wishes, Sentimental Birthday Wishes and Inspirational Birthday Wishes sections to pick the birthday messages that you like the most, then mix and match them into one birthday wish. I need something romantic, something that makes her cry, something that expresses how much I care and love her without showing it. My girlfriend is very beautiful and I love her. She doesn't think that she is beautiful. When I look at her, I see a girl who has been with me for two years and we have two beautiful kids. I see pain. I see frustration. I see a stressed-out girl who needs love and support from me, and even though I have never told her how much I care and love her, I do feel this way. I also want her to know that if she opens my heart, she will see a movie clip of how happy she can be with me. I want her to see that I'm not a perfect guy — I'm just a normal guy who loves her but, in my heart, I'm her knight in shining armor. I'm the one who will save her when she needs help. I want her to know that every time we don't see eye to eye, I still love her, I care about her feelings and I listen to every word she says. There’s nothing and nobody — and I mean nobody — who will ever take that away from me, except her. I just hope that this message will show her how I feel. I need to show her how much I care or how much I love her. I see that subtlety and precision are in order here. Subtlety because you don't want to shout your love from the mountaintop — you want your girlfriend feel it through the magic of a birthday message. Precision because you want this message to hit what you want to express dead on the money. Some people may think that birthday wishes cannot possibly do everything you want from them, but not me. Get started with one of my romantic birthday wishes. Maybe a famous saying from my collection of romantic birthday quotes will do the trick. Or, maybe one of my romantic birthday poems is the route to take. Perhaps, picking the ones that say everything you want to express from each of the sections is the path to follow. If you need more options, check out my Wife Birthday Wishes section. Can you write a birthday message for my best-ever boyfriend? The birthday boy is 34 and he loves rally cars. He's caring and loving. He love me. I love him. He loves road trips. I love you so much I would drive to the ends of the earth for you. With you by my side, my life is always steered in the right direction. I know that the road ahead will be filled with our joy and wonder. Happy birthday! Whether we're with one another or miles apart, you are the first person I think of in the morning and the last one before I close my eyes at night. Have a wonderful birthday. My heart revs for you. My smile for you will never fade. My love for you will never end. I love you...today and down the road. Happy birthday, my love! Or you can use all three. If you need more options, go to my Boyfriend Birthday Wishes section. What message should I give my beautiful girlfriend? By the way, she is an independent person. Do you have birthday wishes for a girlfriend that you don't love yet? It should be a birthday message for a girlfriend. It needs to be funny and a bit cute. Do you have a 12th birthday message for a boy? My boyfriend needs a romantic birthday card. He's sweet, cute and funny...and I love him. I don't know how old you are, so I'm going to assume you're 12 or under. If so, you should keep in mind that most 12-year-old boys have no or very little patience for "mushy" (i.e. emotional) messages. What’s the best route to take? Probably a mixture of cute and happy...with a touch of the sentimental (just a touch). Simply start with one of the options in my 12th Birthday Wishes sections, one that best captures what you want to say...and go from there. Or, if you need messages with a cuter, cleverer, cooler or more romantic tone (although I don't recommend a message that's too romantic at your age), check out my romantic, sentimental, cute, clever or cool birthday wishes section. What type of 57th birthday message should I send to my husband? Whenever someone turns 50-59, I always recommend a 50th birthday-type of message adapted to the age of the person (if they're turning 51-59). When it comes to a husband or wife turning 50 or so, I suggest husband or wife birthday wishes instead. Why? Because the emphasis should be on the person in your relationship, not the age of the individual. As I've mentioned on my site, husband birthday messages should mostly be romantic (even funny, to a certain extent). With this in mind, take a look at all the examples in my Husband Birthday Wishes section. Use one or all of them...whatever best expresses your feelings about your husband. You can go straight to compliments. You can even be a little flirtatious with your 57th birthday wishes. But try to be romantic, no matter what.